Pete The Cat, Big Easter Adventure Book Just $5.72! Down From $9.99! You are here: Home / Great Deals / Pete The Cat, Big Easter Adventure Book Just $5.72! Down From $9.99! Right now you can get this Pete The Cat, Big Easter Adventure Book for just $5.72 (Reg. $9.99) at Walmart! 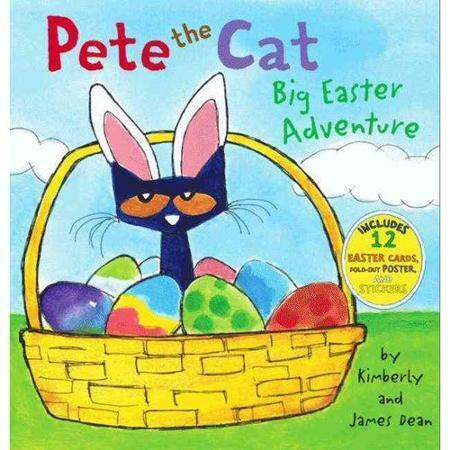 Join Pete in New York Times bestselling author James Dean’s Pete the Cat picture book series as Pete has a groovy Easter adventure. In this paper-over-board picture book, complete with poster, punch-out cards, and stickers, Pete helps out the Easter Bunny Fans of Pete the Cat: I Love My White Shoes, Pete the Cat and His Four Groovy Buttons, Pete the Cat: Rocking in My School Shoes, and Pete the Cat Saves Christmas will love this Easter-themed Pete storybook.